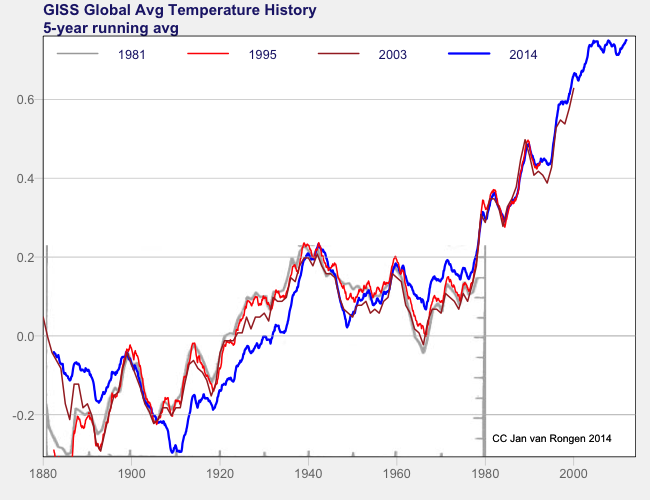 In Part 1 I looked at the “accusations” by Steven Goddard that GISS had changed the historical temperature records several times since 1980. I showed that his major error was simply ignoring the changes in the baselines in the different years. 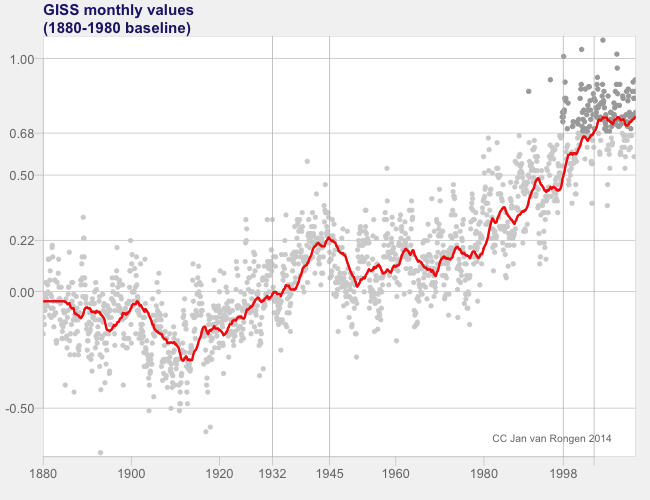 The baseline for the oldest graph was 1880-1890, newer used 1951-1980. In an attempt to see where this came from, I tried to find the origin of the rumours. The oldest I could find is on the site of Steve McIntyre, in Februari 2007.From the comments it can be deduced that he made the same error in the baselines, but later corrected it. Not completely, so his final graph is still a bit incorrect . I found more data – using links on the same site -, completing the picture in this way. The baseline I used is still from the original 1880-1980 period. As can be seen – until 1995 there very small changes only. Then there are slightly bigger changes, but nothing really undermining the overall picture. The changes between the red and the brown line were made around 2000. 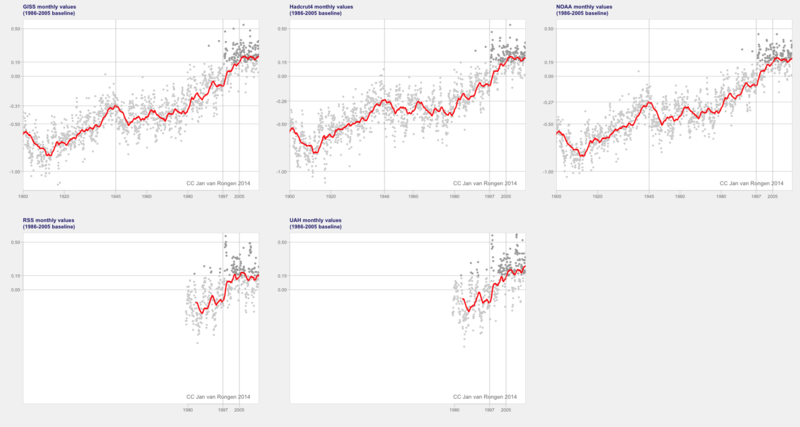 They are documented in a report from NOAA, GISS and HAD (Hansen ea 2001), so this really was a combined effort between the different agencies that produce these time series. The biggest change came after 2003 – that might have to do with the introduction of a new version of the raw data from GCHN in 2011. The 2003 data were the last I was able to found on the internet waybackmachine. There are sceptics and sceptics. The ones that remain scientists all state: there is no tampering of these records, the changes are well documented improvements. Steve Goddard has got it all wrong, say Steve McIntyre , Julia from The Blackboard, and Judith Curry. What you see here is science making progress, slowly.